WomenSafe is a non-profit domestic violence emergency shelter serving individuals and families throughout Northeast Ohio. 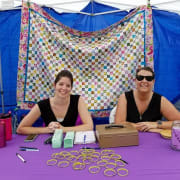 Volunteers are needed to help spread awareness of domestic violence, educate the community on WomenSafe services and raise funds to directly support victims. Do you enjoy getting out in Geauga County? Do you like talking with others? Then this position is for you! -Research local events, art shows and community festivals that WomenSafe could have a table at. No experience necessary, training provided. Must be interested in some weekend hours.